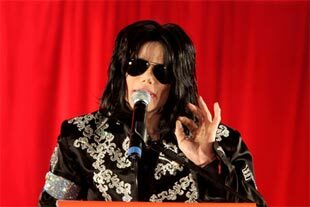 Singer Michael Jackson has sold out all 750,000 tickets to his run of 50 shows at London’s O2 Arena in just hours today, reports Billboard, at an average rate of about 11 per second. Ticketmaster UK called it the “busiest demand for tickets” they have ever experienced. The 50 shows will supposedly take place in July, August, and September of this year, as well as January and February of 2010. The publicity has pushed sales of Jackson’s albums up as well, with sales of Thriller up 80% at stores in the UK and Ireland. The lesson I take from this is that if I act all crazy and allegedly abusive and transparently arrogant and dishonest and mess up my face a whole bunch, I could sell more tickets to my DJ gigs. Although, come to think of it, maybe having something as stupendous as “Don’t Stop ‘Til You Get Enough” on the resume might help, as well. Video for that after the jump.